Once you trap a House Sparrow (HOSP), you have to do something with it. 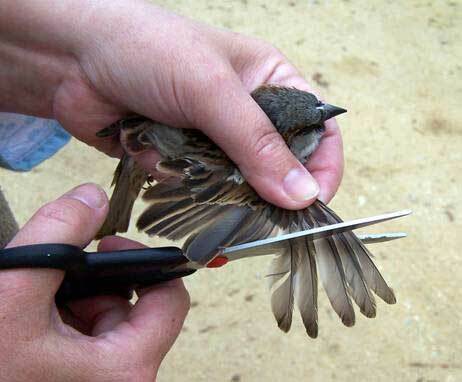 Some people who are unwilling or have ethical concerns about euthanizing HOSP choose the wing trimming method. This is also an option to use on decoys for those who don't have escape-proof ground traps. On decoys, you can trim all the flight feathers on one wing to make them easier to catch if they accidentally escape while removing other birds from a trap. 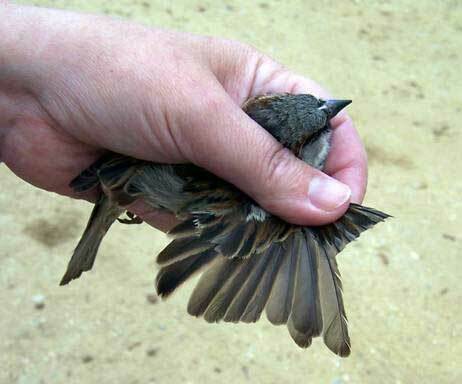 Fawzi Emad, a respected bluebird landlord with considerable experience with this technique, indicates that if you trim wings prior to release, the HOSP tend to become docile and can not attack bluebirds. He indicates they may perch on a nestbox, but do not enter the box, and will not mate. Emad notes that the birds are still able to fly to avoid predators, and to go to a bird bath or feeder. He reports this method has helped reduce local HOSP populations. He speculates that HOSPs may be less likely to fight because trimmed wings reduce their maneuverability. Brian Threlkeld postulates that, in addition, trimmed wings are simply less efficient, and so flight consumes much more energy for a trimmed bird. Consequently, a trimmed HOSP must devote most of its energy to flight (and other immediate necessities, such as foraging), and has little, if any, surplus energy to allocate to aggression. Although the feathers may regrow in about 6 mos., at least it will miss one nesting season (3-5 broods per year). 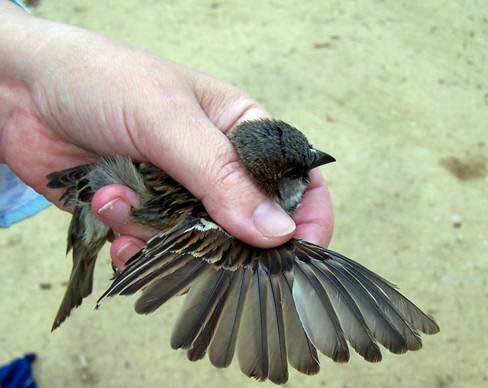 A once-trapped bird may become trap shy if you want to capture it after feathers regrow. Also see other HOSP control options (both active and passive). These instructions are from Fawzi Emad's website. Hold it firmly in your hand. Encircle its neck with your fingers (which prevents it from nipping you), and hold the wings firmly against the body. If you are too gentle, it may squirm loose. Spread the feathers out on one wing. With a sharp pair of scissors, cut the four (female) or five (male) outermost primary flight feathers just below the major coverts (if you leave them too long, it won't be effective): #7-10 on the female and #6-10 on the male in the wing picture shown above. IMPORTANT: Now repeat on the other wing. Then release the bird. Feathers have no nerves, so this does not hurt the bird. Trimmed feathers re-grow in about 6 months. HOSP can potentially live up to 13 years, although in the wild they probably only survive about 2 years. (McLoughlin). Trimming all the primaries, or only one wing will disable the bird. Some people consider trimming one wing inhumane, because it may basically turn the bird into cat food. The birds richly repay you for the trouble you take in attracting them and looking out for their interests.